It's Scott's birthday week and I thought it would be the perfect time to share some of Miko's favorite books! We started reading to Miko as soon as we brought her home from the hospital. Aside from the fact that children who are regularly read to from birth are more like to know more words by the age of 2 and learn to read when they’re supposed to, storytime with Miko provides a special kind of bonding. It’s a little awkward at first--you feel like you’re reading to a blank stare. By the time she was about a month old, she was already starting to respond to mannerism and silly voices, and by about two months she was starting to study the texture and symmetry of the pictures. Now, at six months, books can actually calm her down; she’ll be fussy and as soon as she sees a book she starts looking at the pages and waiting for me to read it to her. She even is starting to help out with turning the pages. Every baby will have different books that excite them. Below are the ones we’ve found Miko most enjoys. Brown Bear, Brown Bear, What Do You See? - This was the first book that made Miko laugh. It’s great for it’s repetition and colors. The Very Hungry Caterpillar - Another great book that teaches baby about colors. This one is a special one for me because she responded most to this book- laughter, excitement, awe, and of course crying when it was over. Oh, the Thinks You Can Think! - Who doesn’t love Dr. Seuss? Apparently, babies! While the Seuss library is great for slightly older kids, they are a little long. Miko loves the rhyming, but she just doesn’t have the attention span for true Seuss classics. This book is like micro-Seuss; it retains the sounds and illustrations of a longer Seuss book, but is short enough to keep Miko’s attention the entire book. Giraffes Can't Dance - If you really want to keep baby interested, then you need to get animated. Just try and read this book without getting excited! It’s silly and easy to get into. The Pout-Pout Fish - This is another silly book that has an added feature that Miko can’t resists: kisses! Lots and lots of kisses. If there’s one thing Miko likes more than silly voices, it’s books that call for mom and dad to tickle and kiss her. Tuesday - This book proves that words are not always required for great storytelling. The entire book is told with pictures. That means it’s up to you to point things out to baby and tell them what’s going on in each page. King Bidgood's in the Bathtub - The illustrations in this book are amazing. We love reading it to Miko before or after her bathtime. Don't Let the Pigeon Drive the Bus - If you can’t get your silly on with this book, then probably no book will work for you! Disney Tails We Love Marie - She may not be the most known Disney character, but if you want your baby to love cats, you can’t go wrong with this one! BabyLit - BabyLit is a series that takes classic books like Pride and Prejudices and turns them into books just for baby; if you want your baby to appreciate the classics later in life, than this is a great introduction. Where the Wild Things Are- This is Scott's favorite. It's special to see Miko enjoy it just like him. My personal favorite- Counting Kisses. I love kissing Miko. One of these days she'll know these kisses are of love and not annoyance, but there's actually benefits to kissing your baby more often. Miko usually has at least two reading times throughout the day. One in the day, and another at night. Her night books are all about sleep. She, unfortunately, doesn’t see the connection between the books and sleep (yet), but night is usually one of her most fussy times of the day, she rarely naps--she’s tired and cranky and these books help calm her down. Pajama Time! - Miko hears this book almost every night right before or after we put her in her pajamas. The Napping House - The most beautifully illustrated goodnight book you’ll probably ever find! Goodnight Moon - Certainly one of the most soothing books for baby, and a true classic. The Going-To-Bed Book - Written by the same author as Pajama Time!, this a silly and fun book to read just before bed. Goodnight, Numbers - Okay, I’ll admit I picked this up because it’s written by Winnie Cooper from the Wonder Years! But it’s actually a great book. It encourages you to teach baby about numbers. Happy Birthday to Scott! What a good dad he is and I'm so grateful our value of reading will hopefully go to Miko! Watch this space for more updates on her books! All links are affiliated, thanks for the support! 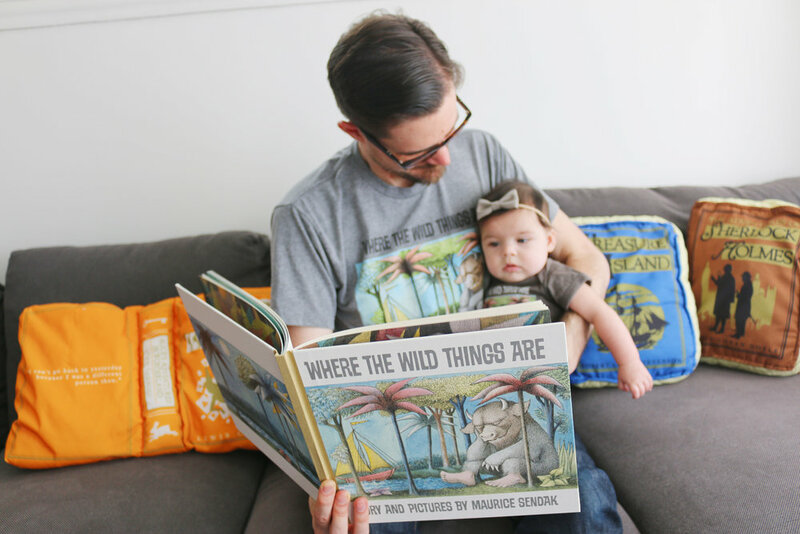 Matching Where The Wild Things Are shirt and onesie from Out of Print Clothing, Miko's bow from Little Poppy Co. If you'd like more reading inspo, I love this tag from Anabela. Happy baby reading! Growing With ErgoBaby- 6 Months!